From the Division of Arthritis and Rheumatism (N.G. ), Department of Neurology (G.H.A., D.N.B. ), Dotter Interventional Institute (G.M.N. ), Departments of Radiology, Neurology, and Neurosurgery (G.M.N. ), and Department of Pathology (S.H.G. ), Oregon Health and Sciences University, Portland; and Neurology Service (D.N.B. ), Portland Department of Veterans Affairs Medical Center, Portland, OR. Vasculitis limited to extracranial vasculature is rare and has not been reported in association with anti-neutrophil cytoplasmic antibodies (ANCA) or minocycline. Here we report such a case. A 27-year-old previously healthy man acutely developed loss of temperature sensation on the left side of the body sparing the face, and clumsiness of the left hand. Initial evaluation, including normal cervical and brain MRI and CSF, was unrevealing. Two weeks later he developed acute-onset numbness on the right side of the body, urinary retention, gait imbalance, and leg fatigability. Review of systems was otherwise negative. His only medication was minocycline, which he used for acne for about a year before development of current symptoms. He had no other past medical problems and no history of illicit drug use. His neurologic exam revealed decreased pain and temperature sensation bilaterally below the C2 level, mild weakness of the left arm and leg, hyperactive deep tendon reflexes in all 4 extremities, and bilateral extensor plantar responses. Laboratory investigations were significant for an elevated erythrocyte sedimentation rate (ESR) of 36, C-reactive protein (CRP) of 3.6, normal urine sediment, elevated ANCA at a titer of 1:160, and myeloperoxidase antibodies at a titer of 21. The remainder of the autoimmune workup, including an antinuclear antibody panel, was negative and metabolic screening was normal. His repeat CSF analysis was normal, including a normal immunoglobulin G index and no pleocytosis, oligoclonal bands, or anti-neuronal or anti-ribosomal P antibodies. Repeat brain and cervical MRI scans were normal. A digital subtraction angiogram of the spinal cord and brain revealed multiple areas of narrowing and aneurysmal enlargement of extracranial branches of both vertebral arteries at C2 and C3 and the radiculomedullary artery supplying the anterior spinal artery at the C5-C6 level (figure, A and C). These changes were consistent with vasculitis. His visceral and intracranial angiograms were normal. A presumptive diagnosis of vasculitis was made and the patient was started on methylprednisolone 1 g IV daily for 3 days. Cervical muscle biopsy obtained after his second dose of methylprednisolone revealed changes consistent with healing vasculitis (figure, D and E). A diagnosis of cervical myelopathy secondary to an ANCA-positive minocycline-associated vasculitis of the extracranial branches of the vertebral arteries was made. Minocycline was stopped and the patient was treated with oral prednisone1 mg/kg daily and monthly cyclophosphamide infusions for 6 months. Following treatment the patient's sensation improved and his motor fatigability, imbalance, and urinary retention resolved. His prednisone was tapered off in 9 months and azathioprine was started to maintain remission. Serum ESR and CRP returned to normal, and angiogram after 6 months of therapy showed near-complete resolution of the vascular abnormalities (figure, B and D). He remains in remission at 12 months on azathioprine. Vertebral angiogram at time of diagnosis (A and C) showing multiple areas of narrowing and aneurysmal enlargement of extracranial branches of both vertebral arteries at C2 and C3 and the radiculomedullary artery supplying the anterior spinal artery at the C5-C6 level. Repeat angiogram after 6 months of therapy (B and D) showing marked improvement. Hematoxylin & eosin stain of cervical muscle biopsy specimen (E) showed thickening of the vascular walls (arrow), perivascular fibrosis, and obliterated lumen (arrowhead). Immunostaining for T cells with anti-CD3 (F) showing T-cell infiltration within the vascular wall (arrows). The biopsy also showed focal disruption of the vascular smooth muscle, recanalization, macrophages within the vessel walls, and perivascular iron deposits, consistent with the healing stage of vasculitis (not shown). This is a case of isolated vasculitis affecting extracranial branches of the vertebral arteries causing a cervical myelopathy. Clinical findings indicated dysfunction in the high cervical cord. Lack of abnormalities on the cervical MRI and his rapid improvement with treatment suggested reversible ischemia without infarction. While the etiology of this vasculitis is uncertain, we believe this was an ANCA-positive vasculitis associated with minocycline. Vasculitis is classified by blood vessel size and tissue involvement.1 Takayasu arteritis and giant cell arteritis involve large arteries and can affect the extracranial portions of the vertebral arteries. Primary angiitis of the CNS rarely involves the extracranial portions of the vertebral arteries but does so along with involvement of intracranial arteries. Systemic vasculitides, such as polyarteritis nodosa, can involve the CNS along with systemic multiorgan involvement. 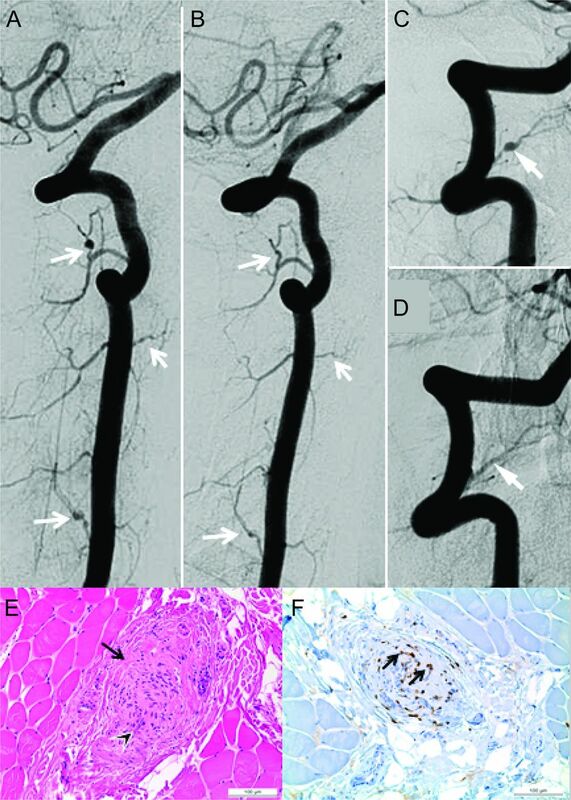 Thus, the fact that this patient's vasculitis was limited to extracranial vertebral arterial branches was highly unusual. ANCA-associated vasculitis is a necrotizing small vessel vasculitis that commonly involves the intraparenchymal vessels of kidneys, lungs, and sinuses but can rarely affect CNS vasculature. Of importance, minocycline has been associated with the development of ANCA-positive vasculitis seen on many occasions, including more common presentations such as cutaneous polyarteritis nodosa2,–,5 and vasculitic mononeuropathy multiplex.6,7 To our knowledge, this is the first report of an ANCA-positive arteritis restricted to extracranial branches of the vertebral arteries associated with minocycline. However, this report is limited to a single case and caution should be exercised before drawing causal inferences from a single case report. In summary, ANCA-positive arteritis can be limited to the extracranial branches of the vertebral arteries, can occur in association with minocycline, and can cause a cervical myelopathy. Normal cervical MRI and CSF do not rule out the diagnosis. A strong clinical suspicion with a low threshold for obtaining angiogram may be required to diagnose this treatable cause of myelopathy. Author contributions: N.G., G.H.A., and D.N.B. jointly conceived and drafted the manuscript; G.M.N. and S.H.G. participated in preparing images and revising the manuscript. Disclosure: N. Garg, G.H. Altowaijri, and G.M. Nesbit report no disclosures relevant to the manuscript. S.H. Gultekin has received honoraria from American College of Rheumatology, American Association of Pathology Assistants, and Pacific Northwest Society of Pathologists; and has received research support from the Lyla Nsouli Foundation. D.N. Bourdette has research grants from the NIH, the Department of Veterans Affairs, and the National Multiple Sclerosis Society; has received educational grants and speaker honoraria from Teva Neuroscience, Biogen Idec, Genzyme, and EMD Serono, Inc.; is an editor for Journal of Medicinal Food and Current Neurology and Neuroscience Reports; is on the Editorial Board for Neurology; holds a patent for the treatment of multiple sclerosis; and receives royalties from DebioPharma. Go to Neurology.org/nn for full disclosures. The Article Processing Charge was paid by the authors. Accepted in final form April 11, 2014.
. ANA (+) ANCA (+) systemic vasculitis associated with the use of minocycline: case-based review. Clin Rheumatol 2013;32:1099–1106.
. Minocycline-induced cutaneous polyarteritis nodosa with antineutrophil cytoplasmic antibodies. Eur J Dermatol 2003;13:396–398.
. Minocycline-induced vasculitis fulfilling the criteria of polyarteritis nodosa. Mod Rheumatol 2006;16:256–259.
. Polyarteritis nodosa-like vasculitis in association with minocycline use: a single-center case series. Semin Arthritis Rheum 2012;42:213–221.
. Vasculitic neuropathy associated with minocycline use. J Clin Neuromuscul Dis 2011;12:231–234.
. Case of minocycline-induced vasculitic neuropathy [Article in Japanese]. Rinsho Shinkeigaku 2010;50:301–305.